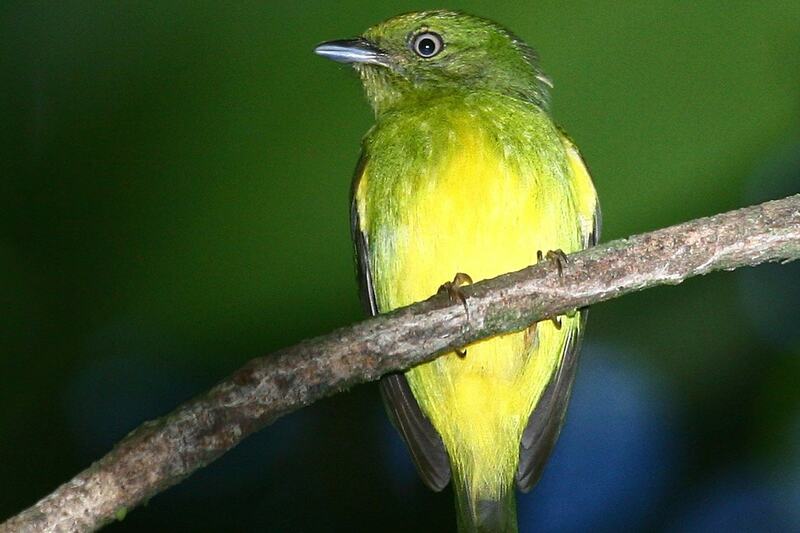 A team of researchers at the University of Toronto has described the first known hybrid bird species to be found in the Amazon rainforest. Through a series of genetic and other tests, the team has revealed that the golden-crowned manakin – first discovered in Brazil in 1957 but not seen again until 2002 – is a hybrid species. “While hybrid plant species are very common, hybrid species among vertebrates are exceedingly rare,” says Jason Weir, associate professor in the department of biological sciences at U of T Scarborough and senior author of the research. A hybrid species forms when two parental species mate to produce a hybrid population, which then stops being able to freely interbreed with the parental species. In this case, the two parents are the snow-capped manakin, named for its bright, snowy-white crown feathers, and the opal-crowned manakin, named for its brilliant, iridescent crown feathers. Weir and his team, which included lead author and former graduate student Alfredo Barrera-Guzman, gathered genetic and feather samples over two separate field trips to Brazil. They were then able to sequence a large portion of the golden-crowned manakin’s genome including 16,000 different genetic markers, finding that about 20 per cent of its genome came from the snow-capped, and about 80 per cent came from the opal-crowned. The researchers also used something called coalescent modelling to figure out at what point the golden-crowned split off from its parental species. They determined it was around 180,000 years ago when the two parental species originally mated, and that both parental species diverged from a common ancestor about 300,000 years ago, making all three very recent birds by Amazon rainforest standards. “Most Amazon bird species diverged from their most recent relative around 1.5 to 4 million years ago, so these are all young birds by comparison” says Weir, an expert on the biodiversity of New World birds. The male golden-crowned has unique yellow crown feathers that are much duller than its parental species. To learn more about this unusual characteristic, the researchers took a closer look at the keratin structure of the crown feathers of all three bird species using an electron microscope. The two parent species each have very different structural arrangements of the keratin, which is responsible for creating the highly reflective colours that help males show off to females in the dark rainforest interior. In the case of the golden-crowned, they discovered it had a mix of keratin structures from both parental species. “The golden-crowned manakin ended up with an intermediate keratin structure that does a poor job of making either the brilliant white or the reflective iridescence of the parental species,” says Weir. The golden-crowned manakin likely had duller white or grey feathers early on in its existence as a result of its keratin structure, but eventually evolved yellow feathers as an alternative way to attract females. The end result is a uniquely coloured species. The golden-crowned manakin lives in an area of the south-central Amazon rainforest that is approximately 200 square kilometres and is largely separated from areas where snow-capped and opal-crowned live by wide rivers that the birds are reluctant to cross. As Weir points out, it likely owes its survival as a species on being geographically isolated from its parental species at some point during a past ice age when rainforest coverage contracted, and wide rivers formed natural barriers. There are some potential candidates of hybrid species in nature, like the red wolf of eastern North America, possibly a hybrid between the coyote and grey wolf. And while hybrids of two species do occur in nature, as Weir notes in most cases they won’t develop unique characteristics to become its own separate species. “This is what makes the golden-crowned manakin such a novel animal,” he says. The research, published in the Proceedings of the National Academy of Science (PNAS), received funding from the Natural Sciences and Engineering Research Council of Canada (NSERC).